Hope you're all having a lovely weekend, it was my birthday today, it was unfortunately not the best start to my 33rd year on this planet. Sadly my nanna passed away today, she always did have impeccable timing... And although we didn't have the closest of relationships, and she had been ill for quite sometime, so the death itself was no great shock, I would still like to dedicate this post to her. My nanna worked as a seamstress all her life and had a great eye for fashion, as a chubby child and a teenager, when I couldn't find fashionable clothes to fit my nanna would make them for me instead. So thank you nanna for the clothes. There you go, not the best birthday, but I did however have the most lovely coat bought for me as a joint birthday/Christmas present from the most unlikely of places, which again links back to my nanna, Bon Marche, yes that favourite of grannies across the land. A little harsh I know, but on the whole pretty true, but they are constantly improving their demographic, and I see more and more great peices coming into store. No, they are never going to set the Plus Size fashion world alight, but I can see them becoming a bigger part of my go to stores for classic pieces and wardrobe basics. 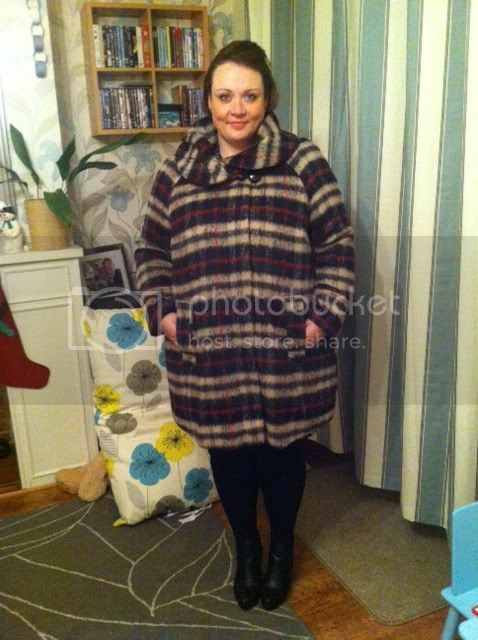 The coat itself is a faux wool, its so soft to the touch and I love the bold check, I love the collar too, and it's very warm (yes I'm aware of how much of a complete granny I sound, well I am 33 after all) and priced at £49.50 I think it's a complete bargain! If you like it, it's available in store and on line, the details of which are here.. Have you found an exciting item in the most unlikely of shops? My mum has pick me up a few nice pieces from Bon Marche, not sure if I'd actually set foot in there myself but there are a couple of things on their website I've had my eye on. So sorry to hear about your Nanna my lovely, love to you all. Happy birthday and condolences for you grandmother's passing. 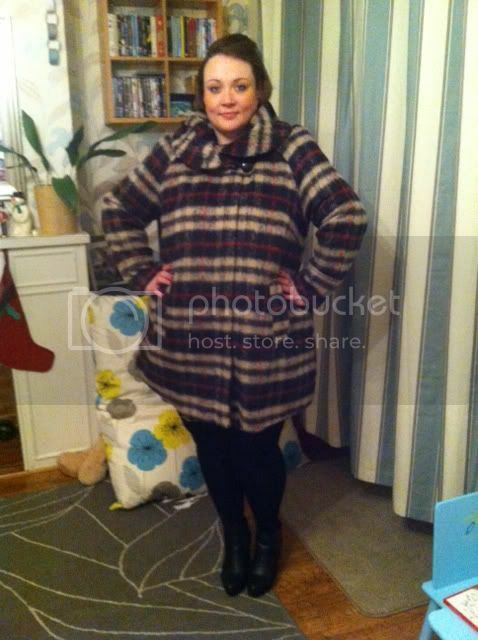 Absolutely wonderful coat, I never would have guessed Bon Marche. Hope this is a sign of good things to come from them. Sorry to hear about your nan. Hope your birthday was still ok, though. I love you in the coat! My grandma died 9 years ago on my 16th birthday. Her last words to me were actually, "Happy birthday, baby!" The first few years were really hard and I felt cheated of both my grandmother and my birthday. But, the pain has eased over time and now I choose to share the day with her through happy memories and not sadness and I can't think of a better person to share my birthday with me. I know you said that you weren't that close but, I just wanted to let you know that if you do find yourself struggling with this, it does get easier.